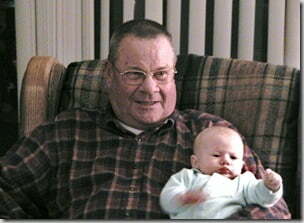 Many years ago Kent’s Dad was diagnosed with Alzheimer’s Disease and he entered into eternal life in 2012. This was been heartbreaking, as you can imagine. If someone you love is in a nursing home, go see them. The nurses often commented about how unique Ron’s family was because they came. Even though he had Alzheimer’s and didn't remember who we were, or probably even that we were there after we left, his soul knows. I’m convinced of this. Our kids would send him pictures with “I love you Grandpa” all over them for the same reason. He didn't “technically” known Mary Ellen in later years, but when visiting him (she was so faithful and went every day), she was the only one who he opened his arms wide for and said, “I’ve been hoping you’d come.” Once he said to her, “Where is my wife? !” She said, “Who do you think I am?” He answered, “I don’t know, but you’re sure one good-looking woman.” Isn’t that the sweetest?! It's so amazing how, just like God says, “the greatest of these is love” – even more powerful than our memory. It’s a sad, sick, twisted world at times, and I don’t know why this stuff happens, but God probably hates it even more than we do. As always, He brings something good from it. Through it all Ron and Mary Ellen taught their sons and grandchildren about staying faithful when it’s not easy, loving when you get nothing in return, and what a real marriage commitment looks like. They’re living examples of our Christian faith and of sacrificial love. And by the way, because Mary Ellen was there every single day, I am convinced that Ron's care was better than the “norm” — all the nurses and aides knew and loved her, so they felt more of a connection with Ron, too. This is what prompted me to look into supplements a few years ago. It’s why he started running, then biking or walking, or some exercise daily. It’s also why he began taking a tablespoon of this coconut oil daily. Alzheimer’s Disease and Coconut Oil? It was after Kent read the following articles that he began taking a tablespoon a day all on his own. I never said a word, believe it or not! Take a look at the article and see what you think. I’d love to hear your thoughts. And say a prayer for Ron & Mary Ellen if you think of it. Dr. Mary Newport about the drastic improvements she saw in her husband when he began taking coconut oil daily. Update: Read my post after Ron passed away in late 2012. What a legacy! Have you read Kent's guest interview from the early days of this blog? – or sliced boiled egg topped with tomato sauce (ketchup?) and herb salt. I used agave syrup instead of honey for mine. I had some leftover chocolate and simply placed some nuts in one of the muffin tins. It was yummy too. My husband had his first taste of coconut oil this way with no complaints. Kathy, I’m not a health professional but have you looked into chia seeds for your omega 3 supplements? They really don’t have a flavor to them. I put them in my oatmeal. I also make a recipe using dates, chia seeds, macademia nuts and chocolate nibs, (powdered chocolate will work also). Check out this NEAT video I just found when googling the above. Warning: it’s a bit gross in one part, it shows a real brain. I thought it was cool, but you may not. We have recently begun using coconut oil in more things. At first it took a little getting used to it but now we prefer it. I use it now in my bread, biscuits and homemade tortillas with great success. I am fascinated by the idea of it helping with Alzheimer’s Disease. My Grandma had early onset AD (in her early forties) and died at age 67. I was one of her caregivers and it is as you know traumatic to watch someone you love disappear. Amen on everything you said about visiting family in nursing homes…and even if they don’t know you. I found the simplest things could reconnect me with Grandma, snippets of songs, certain photographs, family stories. Sometimes no response and at other times a small window opened to her real self. For a fascinating read on AD, I recommend Aging With Grace about the nuns who were studied in the midwest. Their stories are incredible and there are a few tidbits in there about what kinds of activities may help the brain. Some of the nuns, upon autopsy had brains riddled with AD but they showed little or no symptoms. Some had very little AD in their brains, but showed all the symptoms. Katie, from all I’ve read, it’s BEST raw, but there are still great benefits to getting it in your food. Good question! Any idea if the benefits are only from raw coconut oil, or if using it in baking, pancakes, etc is helpful in this arena as well? Thanks so much for going off topic! My father has Alzheimer’s and it has been so hard seeing him decline. Most days he knows I’m someone he knows but not that I’m his oldest daughter. His mother, one brother and his sister all had Alzheimer’s and the 4 of his children have wondered if we would get it too. I know much has to do with the food we eat and what we are exposed to. His doctor said that since he was a mortician that probably the chemicals he worked with are the cause of both that and his Parkinson’s since he was diagnosed after the age of 60. How blindly we eat what is in the store without reading labels! I will certainly increase our coconut oil intake this year. We have discovered it’s health benefits for other things as well. I have heard from friends that it costs too much to eat organic or just good food in general. It costs too much not to! Thank you so much for all your hard work in keeping us informed! My first thought to Kathy’s question (although I’m not a pro or a naturopath either) is – what is your goal? if it’s to add omega-3’s to your diet then how about flax oil or ground flaxseeds? Just a thought here, but I would suggest calling (or emailing) Dave at Green Pastures. He has such an incredible understanding of CLO that if he doesn’t have an answer for Kathy, I’m not sure there is one! Moonwaves, I completely agree – we never know if coincidences are God’s way of leading us this way or that. Kathy, that is a good question for a naturopath or other professional, but my first thought was that maybe you could try taking it every other day or every third day…? Have you tried the Green Pastures c.l. oil? That is less processed and a better quality than others by a long shot – I wonder if that would be better or worse for you? Kelly, I’ve enjoyed reading your posts for a while now and really appreciated this one. My grandma didn’t know me for her last few years, and I didn’t visit her as often as i wish I had. I’m reminded of why coconut oil is such a good idea. I’ve kind of slacked off, but I’m motivated to get back on track. I have another oil question that maybe you can shed some light on for me. I’m deathly allergic to seafood (it’s the iodine content of shrimp, lobster, etc)– and I avoid most seafoods for this reason. I worked on incorporating cod liver oil into my daily routine, even though the smell nearly sent me through the ceiling every time. I could live with that, but after a while, I felt the same kind of early reactions I’d had to seafood when I was first aware that I was allergic. I figured I’d reached my limit of iodine or whatever was in the CLO, and it was making me sick. Of course I stopped taking it (and no more symptoms, thankfully), but now I don’t know what I should take in its place. Any suggestions? Looks like one more topic to add to my long list of things to look into. I bought a small tin of coconut milk for the first times in months yesterday as I was in the fair trade shop and they had just gotten some in. I have chickpeas soaking and am thinking of curry – yum. Seems like such a coincidence to suddenly be reading about coconut oil and I do believe sometimes things like that happen for a reason. I understand your point, however coc. oil is so beneficial in other ways, that it can’t hurt to get more in our diets no matter what our goal is. I looked over that test and I’m pretty sure I’d fail a good share of it *now* – sad but true. SB, that recipe looks so good! I’m going to try it! I make a morning drink everyday before coffee. pour in hot water, stir, drink. its really quite yummy. now I’m also going to add a scoop of gelatine for joint health. Thank you for the link to the article. My father suffers from Parkinsons Disease. The article stated that Parkinsons is helped by MCT. I will let him know. I take coconut oil melted in some warm milk. The lactose in the milk is very sweet and I don’t need to add a sweetener. If you do low carb your taste buds can taste this. This coconut oil milk is very simple and yummy. I think if people are thinking they’ll run out and hop on the latest “x” will help prevent Alzheimer’s they’ll be changing what they do almost every week with every new study. Good genetics and a healthy, active, brain challenged lifestyle – hard to beat that. I put a tablespoon of coconut oil into our smoothies every morning – as well as a few raw almonds, spinach, an egg, and whatever fruit I’m in the mood for. Then I use pure coconut water as the juice – my husband loves it and doesn’t have a clue he’s eating oil or eggs or even SPINACH. His favorite treat is also made with Coconut Oil – POPCORN. Amazingly everyone who’s tried it has gotten hooked on homemade coco oil popcorn. Just a note to make sure that the oil you are getting is expeller pressed, virgin coconut oil – best in a dark container (at least that’s what I’ve always read). And as far as Coconut Oil being a “bad fat”…a few months after I started incorporating “good fats” (including Coconut Oil) into our diets we went for a full physical. The Dr. called me personally to tell me that he had never seen bad cholesterol so low, and good cholesterol so high. Later they told my husband that his cholesterol was amazingly good – and whatever we were doing, to keep doing it 🙂 Thanks for sharing all of these great suggestions & articles! We wish you “power beyond what is normal”, endurance, and patience in caring for your father in law. Haven’t read the link yet, but will. I will be praying for your in-laws. My great grandma had Alzheimers. She too had to be in a nursing home for safety reasons. Putting her in was a hard decision for my grandparents, but they had no choice. SCB, some people say they use coc.oil in smoothies and it doesn’t chunk up (probably depends on the temp), but actually in smoothies I use organic coconut *milk*. Tastes like a pina colada! (https://kellythekitchenkop.com/2008/02/coconut-recipe-dont-like-coconut-try.html) Like Krys said, I also love using it on my skin! That link has more ideas, too. Kristen, I agree that in some cases it’s better to be able to care for parents at home as they age, the way it was traditionally done, but in Ron’s case there were safety issues to be concerned with. Kay, personally, we only taking cod liver oil because it has so much more than just fish oil does. While the kind I recommend (https://kellythekitchenkop.com/2008/10/fermented-cod-liver-oil-series-part-3.html) doesn’t have a *lot* of omega 3’s, it has some (along with MANY other beneficial nutrients in this brand, even more that just the vitamin A & D), and that, along with grass-fed meat, pastured eggs, limiting or avoiding omega-6 veg.oils in our diets, etc., is all we do to get the omega 3’s we need. This is amazing information. My mom had Alzheimer’s and my brother & I took care of her for 5 1/2 years. It’s heartbreaking as you know. I am passionate about the cause and this information is wonderful. I’m writing about the experience with my Mom, and you can read one of my stories at https://tinyurl.com/kqgomg. My hope is to reach people dealing with this disease and bring comfort to them. Thank you for this post! Oops…meant to continue my previous question. I see fish oil capsules readily available but cod liver oil is…obviously…specific. So, just a little confusion with the terms I guess. Great article. I will definitely be adding coconut oil to our diet. Question. Do we need to also take both cod liver oil and fish oil? Thanks for sharing this, Kelly! Alzheimer’s is such a sad disease and it’s commendable that your family regularly visits your father-in-law. He may not recognize who your are, but I bet he still appreciates the company and takes value from your visits! In The Mood Cure, Julia Ross mentions that her father started developing symptoms after increasing his soy intake. There’s a lot of cholesterol in the brain and I’ve read about a doctor who was able to bring on and eliminate Alzheimer’s symptoms by going on and off of statins. Btw, coffee is a great way to get extra coconut oil in, especially if there is cream in the coffee…smoothies are good, too. If a tablespoon is too hard, then try a teaspoon. While a tablespoon may be ideal, it doesn’t mean that a teaspoon isn’t better than none! As in lots of things, we shouldn’t do nothing because we can’t accomplish the ideal. I have also spread it on bread and eaten it like butter ( a little cinnamon/Rapadura sprinkled over it is really good), or before the the peanut butter on a p,b&j. There are lots of creative ways to fit it in! I figure if I can get 1 tablespoon in plain, then between that and the other ways I naturally incorporate it into my cooking, we come pretty close to Mary Enig’s recommended 3 T. total per day. Thanks for the article link, Kelly. Amazing stuff, really. I drink coconut oil in smoothies, hot tea, and coffee. And I LOVE it! For anyone trying to experiment with ways to take it medicinally, be sure to try this. And I am so glad you wrote that bit about visiting loved ones in nursing homes. One of my goals is to help take care of aging grandparents/parents in our home inasmuch as we are able when the time comes. It used to be common to have crazy old people living in our homes, not so much in this day and age. Most of the people in nursing homes don’t need to be there (as in, the care they’re getting isn’t so specifically medical that only trained nurses or physicians can offer it). They just need enough dedicated help with enough things that living on their own isn’t really an option. Sadly, most of us are busy enough that we can’t offer that care, so we put our parents into a nursing home. If at all possible, I want my kids to see and understand that this is what aging, dying, and death look like. Thanks for sharing in the Fight Back Friday fun today. Kelly, I’m so sorry y’all are having to walk this road. This is fascinating information, though, and is such a simple thing to do. If you’ve ever watched anyone decline with Alzheimer’s, you’ll know that if this can help, it’s definitely worth it. IMy 4 siblings and I lost our dad in 1981 to early onset Alzheimer’s. When the initial diagnosis came back to my dad’s family doctor from the specialist, he (the dr.) told us he had to go look it up because he’d never even heard of it. Just think how things have changed since then…who HASN’T heard of it these days? My parents were both 51 when he was diagnosed, 54 when he died. It was such a sad time, but true to His word, God was faithful to never to leave or forsake us. Many blessings, and prayers…. I put a tablespoonfull on my oatmeal or other hot (soaked) cereal in the AM. I have actually put it on cooked veggies instead of butter sometimes & that worked well. I’ve also recently started using coconut oil. So easy ways that I use is are: in smoothies, I heat the oil first then add in coconut milk and fresh or frozen fruit and give it a whirl. I tried yesterday to do it without heating first, and it created lots of little chunks! I also take dark chocolate squares and top them with a little bit of the oil. It is delicious that way! In addition, I am using it on my skin and hair at night. I love it! Hi Kelly – I’m curious (like Liz F.) about coconut oil in smoothies, seems like a great place to sneak it in, any downsides to this? The only thing I can think of is any icy ingredients might cause the coconut oil to solidify? Kelly, Please read this in regard to visiting someone w/ alzheimer’s!!!!! gentleman in his 80’s, arrived to have stitches removed from his thumb. needed supplies to remove his sutures and redress his wound. acceptance of all that is, has been, will be, and will not be. just make the best of everything they have. I was taking 1 tablespoon. I just added some to our fruit smoothies this morning and I’m hoping this will be okay. Thank you so much for posting this! I have been concerned about the Alzheimer’s that runs in my family, and wondering what I can do to try to prevent it. This gives me even more reason to buy some coconut oil! Sara, I just added some to my coffee to try (thanks for the idea!) and I don’t taste it, maybe because it’s already coconut flavored coffee! Liz F., it seems a lot of people have that problem. I find in hot coffee is best. I can take a spoonful of it, but it sits on my tongue and I’m not quite sure if I should swallow or spit. Kelly, I don’t know if this is the same family, but I read an article about reversing Alzheimer’s being reversed w/coconut oil & products. It’s pretty amazing that something as simple as coconut oil can make such a difference. Even though I know your family is heartbroken over your father in law, it’s very sweet to hear of your mother in law and the kids not giving up. That article is an eye-opener, especially considering that Dr. Mike Eade’s says that the brain prefers to run on ketones. I’ve also read that a ketogenic diet can help shrink certain brain tumors. Kelly, I found that article facinating! I’ve been working hard at getting more coconut oil into my diet, but I’ve found I simply cannot take it by itself without disasterous affects on my stomach. Much of what I’ve read talks about dissolving it into tea or hot water and I just can’t do that. Yet if it’s prepared with food I’m fine. Just wondering if anyone else has had that problem? Interesting stuff! Thanks for sharing!